Usually, when one thinks of rocks and geology it’s all a bit impersonal; after all, they were formed in the distant past, in many cases hundreds of millions of years ago. 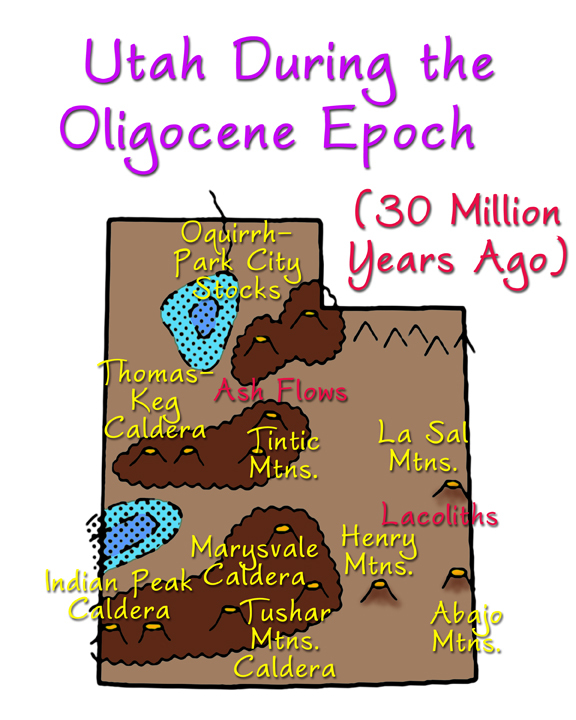 Most of the rocks in western Utah, where I’m from, were laid down as ocean deposits during the Paleozoic Era. Now all the layers of shale, limestone, and dolomite have been thrusted, twisted, and even overturned, so that in some areas the Paleozoic rocks lie on top of younger Mesozoic rocks. How could this have happened? But in addition to these sedimentary rocks, there are some anomalies; whole mountains that puzzled me because they didn’t fit in. My grandfather, who lived next door to us in our small hometown of Deseret, would take me for drives out on the west desert looking for trilobites or pine nuts or just collecting rocks. One area we visited was Topaz Mountain at the southern end of the Thomas Range in Juab County, where one can find topazes just by walking along an arroyo on a sunny day, following the flashes of light. The rocks there are weird, with strange cavities and a light gray texture much different than the surrounding mountains. I wondered where it came from, how the topazes got there, how old the rocks were, and above all, how geologists were able to answer these questions. This was all very interesting to me as a child, but then geology got personal. My father was a farmer and cattle rancher, and one day in June of 1971, we were hauling a load of yearling heifers out to our ranch in southern Tooele County (about 50 miles due north of Deseret). As we were driving our old 1952 model half-ton truck over the pass on Desert Mt., the brakes and clutch both failed at the same time and we found ourselves rolling down the steep and winding road without any means of stopping (the road has since been improved, as you can see at right. Back then the road cut along the left side of the pass and was much more dangerous). Dad tried to slow the truck down by ramming it into the embankment on his side, but the impact jarred the cab, flung open the door on my side, and threw me from the cab (this truck had no seat belts). Fortunately, there is a gap in my memory at that point for several seconds. The next thing I can remember is lying on my back looking at the truck as it rolled away from me and disappeared out of sight over the edge of the embankment. Then I saw my right leg, which was twisted unnaturally, with my thigh badly torn up – a whole piece of my thigh seemed to be missing, as far as I could see through the tattered remains of my pants. The best I can figure is that the rear dual tires of the truck rolled over my leg, breaking it in two places and tearing up the skin and underlying tissue badly. Or my leg dragged over the rough, sharp rhyolite rocks of the mountain. Or both. This was a hot day in June. We had water and snacks, but my father had sprained his ankle and could not walk. This was before cell phones or even CB radios, and we had no way of getting help. You have to visit the west desert of Utah to appreciate just how isolated it is. Dad lit the truck on fire, hoping the column of smoke would attract attention from the ranchers (including my grandfather) across Ereksen Valley, but no one saw it. Hours dragged by. I was slowly bleeding to death as blood seeped out of my wound, and I was going into shock. After about five desperate hours, my father saw a car sitting on the road leading up to the pass; they had stopped when they came around the corner and saw the smoldering remains of our cattle truck. Dad stood up and waved, and they drove on up. The car was driven by a an elderly couple from Odgen, Utah: rockhounds who were out on the west desert looking for Topaz Mt. All they had was a hand-drawn, inaccurate map and they were off course by 40 miles. Dad was able to ride in to the nearest phone (about 15 miles) and call the ambulance and Doc Lyman from Delta. After several days in Intensive Care, two months in the hospital with skin grafts, and another three months in body casts, I was finally able to walk again. I am lucky to have two legs. So my life was profoundly affected by the geology of Utah’s west desert. Desert Mt. almost killed me; Topaz Mt. saved my life. So I have understandably been curious about the geology of these two mountains. I can honestly say that I am a part of that geology – somewhere on Desert Mt. there’s a small patch of dirt that used to be me. And that geology is a part of me, too – the doctors were never able to get all of the small rock fragments out of my leg that had been ground in. Yes, I know it’s a bit grotesque, but it’s literally true. That’s why I’ve wanted to complete these episodes on the beryllium deposits of western Utah before doing any others, because telling that story includes the story of the geology of the area and how those two unusual mountains came to be there in the first place. The episodes are coming along nicely, and I have completed the geology section completely and offer it now for your enjoyment. The first episode (on the sources, uses, and geology of beryllium) will be ready in a few days; the second episode on the mining, refining, and hazards of beryllium will be ready by next week. To understand the origins of the beryllium deposits in the Spor Mts. we have to go back to when western Utah was still under the ocean. For hundreds of millions of years, this ocean floor built up gradual layers of shale, limestone, and dolomite. The North American tectonic plate began to separate from the rest of Pangaea about 200 million years ago and was moving westward into the Farallon Plate, which was subducting under the western margin of North America. The sediments carried down with it were heated and rose toward the surface to cool as the granitic plutons of the Sierra Nevada Mts. For the first time, the western half of Utah and Nevada rose above the ocean. Then, about 150 million years ago, the North American Plate sped up; instead of moving about 2.5 cm per year, it leaped ahead at the breakneck speed of about 8 cm per year. Instead of subducting, the remnants of the Farallon Plate were pushed under western North America, scraping and dragging the roots of the continent with it. This friction caused a wave of thrust faulting and mountain building to travel west to east across Nevada (the Nevadan Orogeny), then across western Utah (the Sevier Orogeny) about 125-75 million years ago. A huge mountain range rivaling today’s Rockies sat on the Utah-Nevada border, with sediments washing off of it into an inland sea to the east to form the upper layers of the Colorado Plateau as dinosaurs wandered through the mud flats and swamps. These swamps became the coal deposits of central and eastern Utah. As the thrust faulting continued east, it encountered the thick Colorado Plateau and bent it into the huge anticline of the San Rafael Swell. When it reached Colorado and Wyoming about 55-60 million years ago, the thrust faulting created the Laramide Orogeny that resulted in the Rocky Mountains, including the Uinta Mountains of northeast Utah. About 50 million years ago the North American Plate slowed down again and the remnants of the Farallon Plate collapsed from underneath, pealing away in a wave that now traveled from east to west. A wave of volcanism traveled with it, moving back across Utah and Nevada. Much of the mineralization found in Colorado, Utah, and Nevada occurred at this time, including the silver, copper, zinc, lead, and beryllium deposits of Utah. 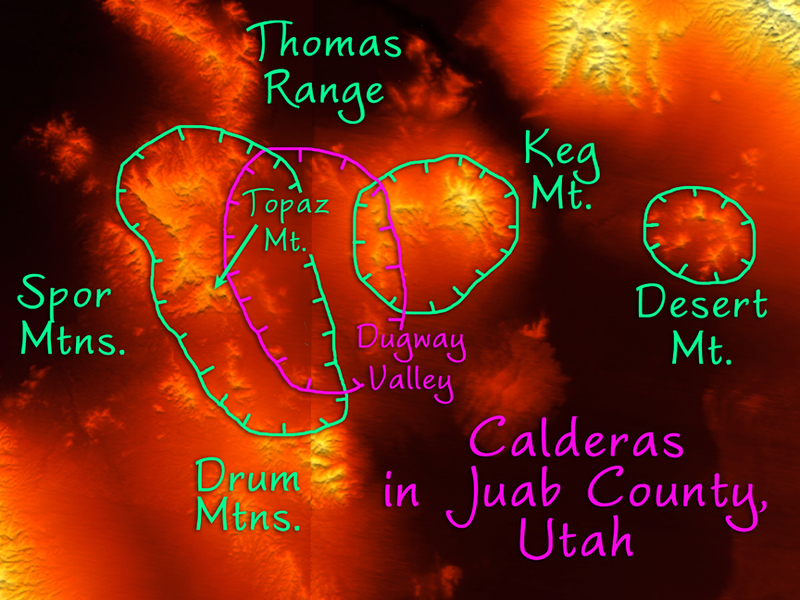 In western Utah, the volcanism produced several zones of Andesitic volcanoes with calderas and ash flows, including the Thomas-Drum Mt. caldera along with calderas at Keg Mt. and Desert Mt., about 45-39 million years ago and continued for at least 30 million years through several phases. In the first phase, quartz-rich magmas formed the calderas and ash flows that covered much of the area and produced the gold, copper, and manganese deposits of the Detroit District in the Drum Mts. 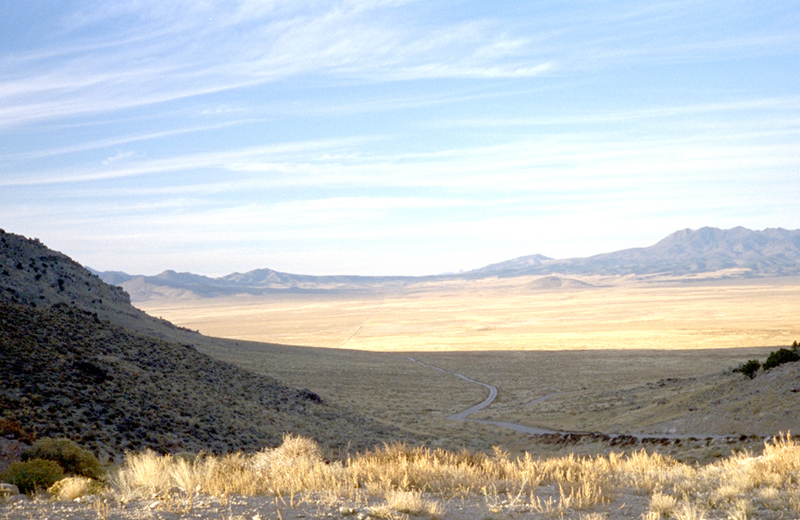 The second phase of area volcanism occurred as the calderas in the Spor and Drum Mountains subsided and were filled with rhyolite from the Dugway Valley caldera about 38-32 million years ago. The ancient thrust faults and collapsed calderas created fractures, which served as avenues to intrude veins of mineral-bearing magmas. Beginning about 25 million years ago, a third phase of volcanism pushed domes of highly alkaline rhyolite rich in fluorine and beryllium up through these fractures. 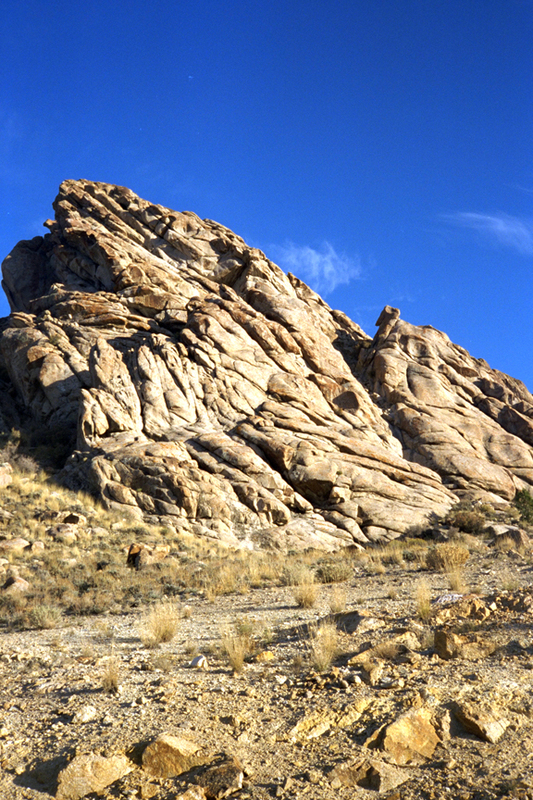 The fluorine and beryllium minerals formed gases that were injected into the thrust faults and eventually encountered ground water, which flashed into steam, shattering the surrounding rhyolite and forcing the beryllium minerals to precipitate throughout the fractures and empty spaces in the host rhyolite rocks. Gradually, minerals were deposited as crystals of topaz, fluorspar, garnet, and bertrandite in the Thomas-Spor Ranges, and red beryl in the Wah Wah Mts. 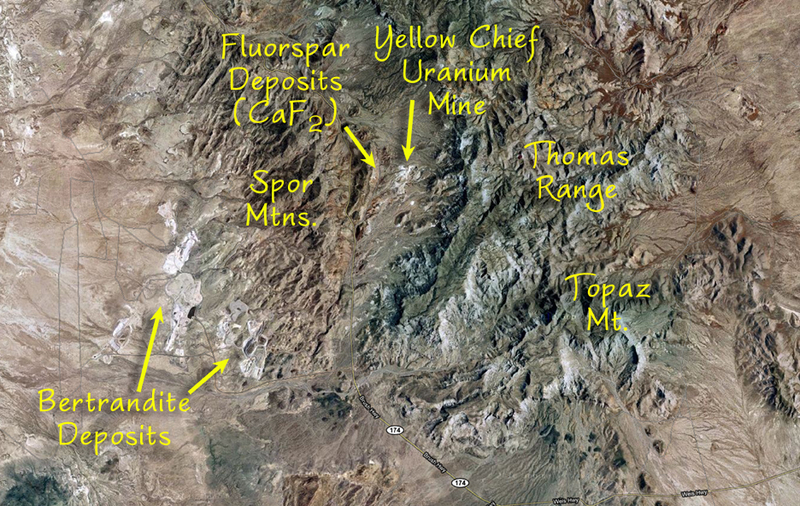 Additional trace elements such as uranium, lithium, aluminum, zirconium, iron, and thorium were also deposited. I was following a link that pre-clovis peoples made western stemmed points from Topaz Mountain obsidian “http://www.academia.edu/791679/New_obsidian_hydration_findings_suggest_the_use_of_split-stem_points_by_Great_Basin_Paleoindians” . This was a follow-up to latest evidence of Ontario Metor in 12,900 BP “http://www.examiner.com/article/research-younger-dryas-period-began-with-canadian-meteor?cid=rss” Your article on how the obsidean formed, and Utah geology in general, was just what I was looking for. Thanks. And sorry about that leg.